At a time when digitalization and innovation are at the heart of issues facing enterprises, whatever may be their size or sector of activity, they must anticipate issues and adopt an agile and resolutely innovative and entrepreneurial attitude. Only by doing this will they be able to secure their future and compete on an equal footing with the GAFA (Google, Apple, Facebook, Amazon) and the likes of Uber, by creating high use-value services that customers want and that will enable them to find their niche in these new ecosystems. 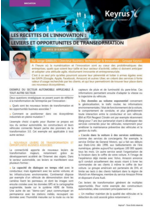 -What are the new transformation levers and the associated business opportunities ? -How should the enterprise position itself in these drastically changing industrial ecosystems? The example chosen below to illustrate this topic comes from the automobile sector, automobile manufacturers and their connected vehicles being amongst the pioneers of the 3.0 transformation. This example can be applied to any other sector. A capacity for real-time dialogue with the driver, but also with other cars and surrounding infrastructure. For example, Continental has a demonstration vehicle with cameras that read signs, the images then being cross-referenced with GPS data and the enhanced mapping function, based on Nokia's HERE system. Another of its "demo-cars" can continually communicate with weather stations, cross-checking this data with levels of humidity measured on the road or via the rain and light sensors on the windscreen. This information then enables the speed or direction of the vehicle to be adjusted accordingly. Data that is exponential in volume, relating to geotracking, road traffic, environmental information, the working order of the car, driving behavior, and more generally any interactions between the driver and his vehicle. For example, IBM and PSA Peugeot Citroën have recently agreed a 7-year extension of their partnership aimed at developing connected services for vehicles, notably to improve preventive vehicle maintenance and traffic management. In-car access to external services, such as concierge services. For example, General Motors' OnStar service, which began in the United States as early as 1996, when the digital era was in its infancy, today generates some 100,000 calls a month. Another service would be to organize delivery into the trunk of your car. Like the experiment already conducted with Volvo, Amazon has announced that it is currently undertaking trials with the aim of delivering its customers' orders right to the trunk of their car. The American group is a partner of DHL and is limiting its tests to customers who live in the Munich region of Germany, subscribe to the Amazon Prime service and have an Audi. - Continuous monitoring, because by being informed in real time of a car's mileage, the manufacturer can use this data to ensure that drivers have their cars serviced when they should. - Problem prevention, because by analyzing the history of a car's driving data it is possible to undertake "predictive" maintenance and identify pointers towards breakdowns and critical situations ahead of time. Significantly improving the after-sales experience and loyalty to the network. - A connected car will be able to perform its own check-up, alert the driver when the next servicing is needed, put him in touch with his contact garage and arrange an appointment at the most convenient time. It will even be able to send the garage a prior diagnosis which will make it easier for the garage to deal with the car when the driver brings it to the workshop. - The sale of data, bearing in mind that the manufacturer could sell its vehicles' data to players in other industries, such as, for example, insurers for their "pay-as-you-drive" and "pay-how-you-drive" contracts, or local authorities for traffic forecasting. - New BtoC services, because a connected vehicle will be able to optimize your journey and each of the points of interest that you will come across along the way. For example, as you approach your home, the vehicle will be able to advise you on the best place to park, deal with paying the parking charge, and then point out to you places nearby that are likely to be of interest to you (shops, public places, ...). - New BtoB services intended for vehicle fleet managers. For example, the "Peugeot Connect Fleet Mgt" service which helps managers optimize the "Total Cost of Ownership" (TCO) of their fleets of vehicles by using consumption data, information on hours of use, preventive maintenance, mechanical alerts and details of fuel levels. This service also encourages environmentally friendly driving, by analyzing driving styles and comparing different drivers in a fleet in order to offer individual advice to each driver. Finally, it indicates the location of the fleet's vehicles in real time, making it possible to identify a vehicle that is close to a strategic point and display journey routes. Once the enterprise has decided upon the business opportunity to be pursued, it must develop the appropriate ecosystem and adopt a clear positioning. Data producer: here, the manufacturer refocuses on improving the quality of vehicles and on selling the data coming from them. - This is the role that seems the most natural for an automobile manufacturer like for any mobility operator, since, in their position as rental firms, leasers or "car-sharers", they are at the source of the data. - The prerogatives of a "data producer" are to collect data from vehicles, certify them, and make them available (for example by API management) for its own use or use by a third party. - Developing the required ecosystem will be that much easier for a manufacturer since the environment is natural to it. Services aggregator : here, the manufacturer proposes new BtoC or BtoB services in its name and significantly improves the customer experience - with regard to after-sales services for example. - A services aggregator integrates all those services that already exist and supplements its offering in order to make it into a unique, homogenous, and fluid new customer experience with high use value. Thus, in the example where the car identifies a potential problem, the services aggregator must integrate, in a real-time, continuous flow: a self-diagnosis service, a dialogue with the driver to warn him, and then the organizing and coordinating of the workshop visit with the garage. The vehicle can then communicate the self-diagnosis to the garage, so that the mechanics receive in advance the information they need to prepare the work they will be carrying out in the workshop. - For after-sales service, the manufacturer can develop the right ecosystem on solid foundations since it already has dealings with its after-sales network and its garages. In addition, this new position as aggregator could put it back "at the heart" of the customer relationship, by shifting from a relationship of "driver <> garage <> manufacturer" to a relationship of "driver <> manufacturer <> garage". An enterprise from any other sector than that of the automobile can very probably benefit from the same transformation levers (capacity for real-time dialogue, exponential volume of data, ability to call upon services performed remotely) and identify new business opportunities. The growth drivers will thus have to be found in an ecosystem and with a positioning that will no doubt be new to the enterprise. Likewise, it may prove necessary to meet new technological challenges and develop the organization by creating new departments and/or business units. A forthcoming expert opinion is due to be published on these topics entitled "Recipes for innovation: technological and organizational challenges". By Serge Darles, Director, Business Technology and Innovation, Keyrus Group.